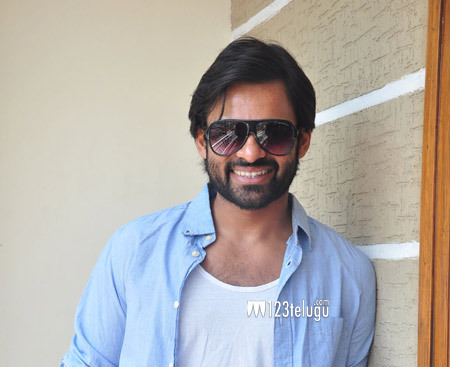 Young hero Sai Dharam Tej, is back with a typical commercial entertainer Supreme. On the eve of the film’s release, we caught up with him for a brief interview. Here is the transcript. Q)Why did you name the film Supreme ? A)It was the idea of the production house. As they felt the film had entertainment of top level, they named it Supreme. Initially, I was a bit skeptical but was later convinced once I heard the script. Q)What is you gut feeling about the film ? A)Supreme is a film for ages 6 to 65. Right from the first frame, there will be huge entertainment which will impress every section of the audience. Q)Tell us about your character ? A)I play a cab driver called Balu, who goes that extra mile to solve the problems of others. Q)How was it working with Raashi Khanna ? A)Raashi has a very interesting role in the film. She is like the main comedian and will leave you in splits with her performance. Q)Working with Dil Raju ? A)Dil Raju is like a family member. I have done many films and the way his banner showcases me is so good. I will be always great full to them for offering me such wonderful films. Q)Tell us about the director Anil Ravipudi ? A)Anil is very clear in what ever he does. He had a lot of pressure of delivering a hit after Patas but never showed it while directing this film. The way he has narrated the script with superb fun will work big time. Q)There has been a criticism that you are always remixing you uncle’s songs. What do you have to say about it ? A)I know. A lot is being written about it. But, I feel very proud to be doing them as it is like paying a tribute to the legend Chiranjeevi. Q)Is it you who demands these remixes in your films ? A)Look, I am just four films old and am in no position to demand anybody. It is the decision of the production house and they take a final call. Q)Did you show the film to Chiranjeevi garu ? A)No ! he will watch the film tomorrow. Q)Reports suggest that you are doing a film called Gang Leader ? A)No ! it is untrue and I am not doing any such film. Q)What is the update on Tikka ? A)The film is nearing completion and only some 10 days are left to be shot.